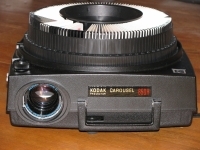 This 1970s-era Kodak Carousel slide projector was, in its day, a very popular device used to deliver photographic content to groups of people. Now, images can be delivered much more easliy and efficiently using data transmission and devices such as computers and tablets. In his "Director’s Column" appearing in the August/September issue of Westlake Porter Public Library's Notes newsletter, WPPL Director Andrew Mangels, in introducing his facility’s "Make Event" program set for Aug. 23, explains how libraries are transitioning from being strictly providers of content to additionally being places in which to facilitate the creation of content. A very cool concept, in my opinion, and a logical extension of Director Mangels’ continuing philosophy of libraries being providers of all sorts of content, going well beyond traditional printed material. The idea of library patrons creating content generated a wave of nostalgia in me relating to what content, and its creation, meant to school students years ago. Generally speaking, when I attended Bay High School in the mid-1970s most students created content intended to be seen or heard mainly by their teachers. That content included things like written essay assignments and reports, art or shop projects, test and quiz answers, and musical performances. The basic point of it all was to have that content evaluated by their teacher. Still, a number of students did create content with a much wider audience in mind. 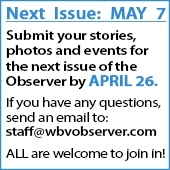 Some students wrote for the school newspaper or literary journal (The Bay Window or Bay Bits). Some wrote or captured photographs for the yearbook (Bay Bluebook). Yet others created content by performing on stage or being engaged in sports. Back then, though, students were more apt to be consumers of content rather than creators. Textbooks and teacher-delivered lessons were classic sources of content. Content was sometimes delivered via audio/visual equipment, as well. The thing is, at that point in time, none of the content that students did create was likely to be viewed by anyone much beyond the immediate community. Today, of course, the internet has vastly increased the potential geographic range and audience of content created by students in particular, and everyone in general. I never imagined back when I was a student that, for example, a photograph I snapped could ever possibly be seen by someone half a world away with simply the click of a mouse or touch of a screen. Today, though, posting a JPEG image or other type of file online to any of a wide array of websites is literally a trivial event. With the tools and resources to create both informational and physical content available today – and being unimaginable to all but the most visionary among us 40-some years ago – one can easily see why Director Mangels sees the need for libraries to add facilitation of content creation to their long list of services. It's a shame most folks will likely never experience being around a well-running 16mm movie projector these days, though. I'm a longtime resident of the Bay Village and Westlake area (Bay 1965 to 1977, then Westlake since) who has always enjoyed living here while seeing lots of change over the years.